Is there a more suitable icon for the automotive service, maintenance and repair industry than the jack stand? Still, how many "discount" versions of the jack stand are out there? Gazillions, right? The reason that there are so many varieties and claims about jack stands is just about everyone in aftermarket sales makes a version of this classic product. While just about every jack stand will "serve its purpose," (i.e. hold the weight of a vehicle up to its rated capacity), the true measure of a jack stand is more subtle. You need to consider how stable the stand will be if it’s bumped or nudged. You want a company with a reputation for considering these things in their design. Ranger jack stands feature a legendary solid design, welded steel construction and a ratchet & pin safety mechanism to keep them locked under load. Meant to work as a team, pairs of Ranger stands come in capacities of 3 tons, 6 tons and 12 tons. 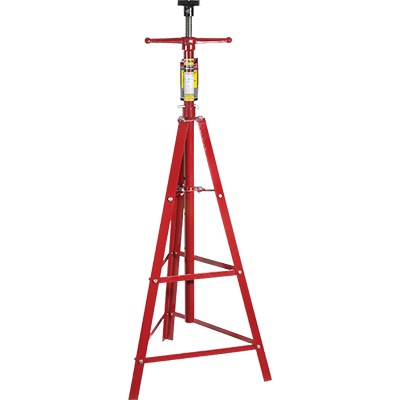 We also supply a sturdy line of totally adaptable high-reach jack stands that are ideal for stabilizing up to 2,000 lbs. of lifted vehicle or holding drive-train components. 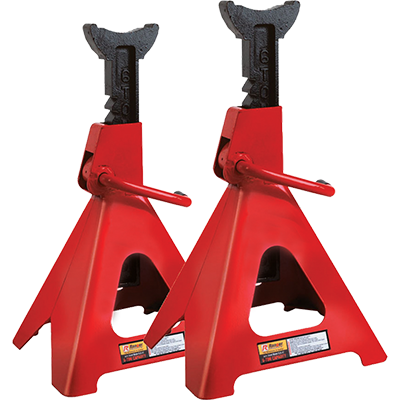 When used together, these heavy-duty jack stands will safely support up to 3 tons. The rugged ratchet ladder audibly snaps into a secure hold. At each ratchet point, a slender but powerful pawl is over-engineered to easily accommodate the rated lift capacity. 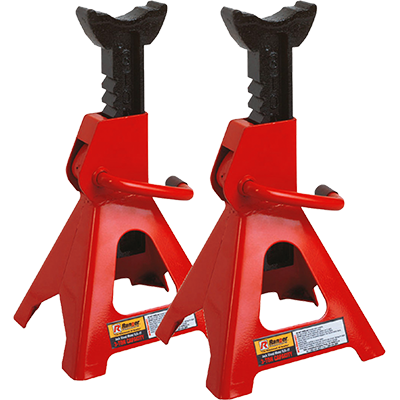 When used together, these heavy-duty jack stands will safely support up to 6 tons. Our models are arguably the safest, most versatile stands available today. Starting at $85 + FREE SHIPPING! Starting at $155 + FREE SHIPPING! This extremely mobile yet beefy tripod jack stand stabilizes up to 2 tons worth of vehicle, making it ideal for servicing heavy-duty vehicle transmissions, exhausts and engines that are raised on a two-post lift or four-post lift. Starting at $135 + FREE SHIPPING! This high-reach jack stand features a 1,650 lbs. holding capacity. It expertly balances vehicles that are raised on a car lift. Starting at $125 + FREE SHIPPING! 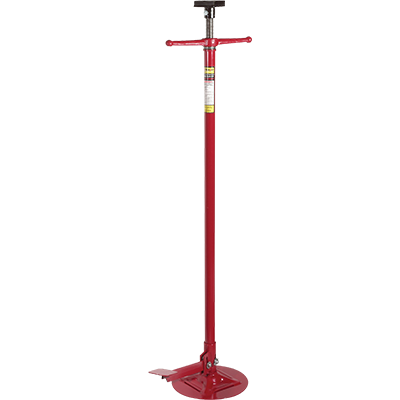 This high reach jack stand features our exclusive "Jiggle Jack" foot pedal and stabilizes up to 1,650 lbs. worth of automobile being supported by a car lift. Every jack stand we offer is safe, rugged and made from the best materials. If you’ve ever used a Ranger product, you've felt the difference right away. The steel on our stands is made from the same top-notch raw material as our BendPak lifts, and each jack stand is manufactured in a BendPak / Ranger facility. Many "discount" brands can’t even tell you how their products are manufactured because they outsource their labor to the lowest bidder. This is not just a dollars-and-cents issue: it’s life and death. 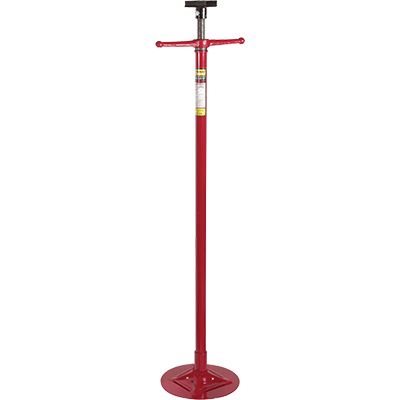 We want to be able to look you in the eye and say, "Of the hundreds of jack stand suppliers out there, Ranger Products makes an incredibly durable product that surpasses ANSI/ASME minimum standards and will make you feel extremely safe while you use it." We can, and we do. 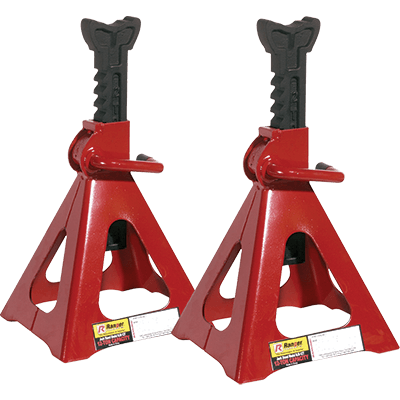 Virtually all jack stands feature a ratchet ladder that locks into place with a pawl device. While Ranger jack stands feature this same locking feature, the difference is in our construction. Our pawl is coated to never stick, rust or decay over time, and the release handle is fined-tuned, so it doesn’t feel loose or flimsy. The last thing you want is your safety device to feel cheap, but that’s the risk you run with many other brands. Ranger jacks stands are extremely affordable, but the true value comes by way of our design and the safety measures we build into each stand.